We are ecstatic to announce that 2017 Kalleske Clarry’s GSM has won the 2018 Winestate Australian & New Zealand Organic Wine of the Year. 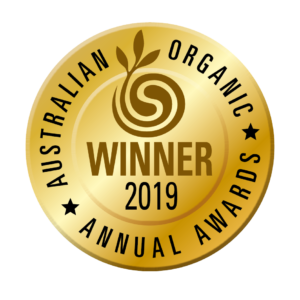 “To win the top organic wine award for all of Australia & New Zealand is a huge honour, especially considering the high calibre of wines entered from fellow producers. 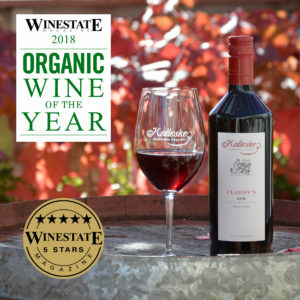 This award is a reflection of the dedication and pioneering work of our parents, John & Lorraine, in farming certified organically for the past decades and today passionately continued by our brother Kym who presently manages our family vineyards providing the top quality organic grapes for all of our Kalleske wines.” Troy and Tony Kalleske. 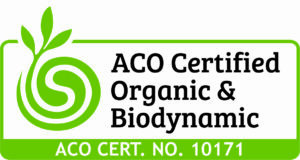 Winning the Winestate Australia and New Zealand Organic Wine of the Year has topped off a successful year for the 2017 Clarry’s GSM after already receiving a Blue/Gold Award and making the Top 100 Wine of Competition at the 2018 Sydney International Wine Competition as well as winning a Gold Medal at the 2018 China Wine & Spirit Best Value Awards. The 2017 Clarry’s GSM (Grenache Shiraz Mataro) is an approachable, fruit-driven and opulent GSM with an intense bouquet and a full and well rounded palate. You can purchase the 2017 Clarry’s GSM HERE or drop into Cellar Door at 6 Murray St, Greenock SA when you are in the Barossa next. Our Kalleske Florentine Chenin Blanc is back!